Making sure your bearded dragon is exposed to enough UVB light is very important for their health and welfare. 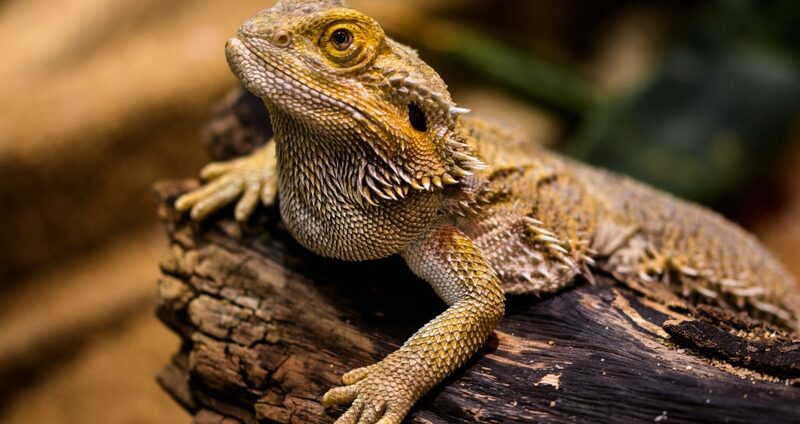 If a bearded dragon isn’t provided with an adequate amount of UVB light they can suffer metabolic bone disease (MBD). 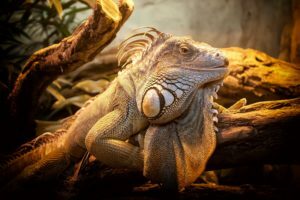 That’s why selecting the best UVB light for a bearded dragon is one of the most important decisions you will make as a bearded dragon owner. Since bearded dragons come from the desert they require more UV light than tropical reptiles. A bearded dragon will need a UV light that provides at least 8-10% UVB radiation, in order for them to stay healthy and active. Most bulbs will have their UVB output on their packaging, but if they don’t another way to tell is if they say “desert” somewhere on the label. 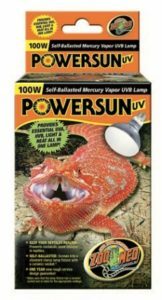 The Zoo Med PowerSun UV Self-Ballasted Mercury Vapor UVB Lamp (Buy Online) is one of the best UVB lights for a bearded dragon on the market. This mercury vapor bulb for bearded dragons emits both UVA, UVB and heat all in one convenient package. If you need a UVB light that can penetrate deep into a bearded dragons habitat this bulb is one of the most powerful options. 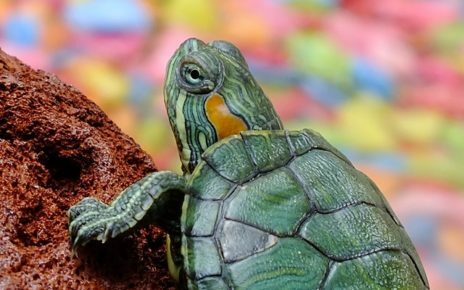 This bulb can be placed anywhere from 18 to 36 inches above the base of your habitat while still providing your bearded dragon with its full UVB output. The 100-watt PowerSun UV Self-Ballasted Mercury Vapor UVB Lamp will last up to 10,000 hours of regular daily use. It should only be used in a light fixture with a ceramic socket since it produces a good deal of heat. 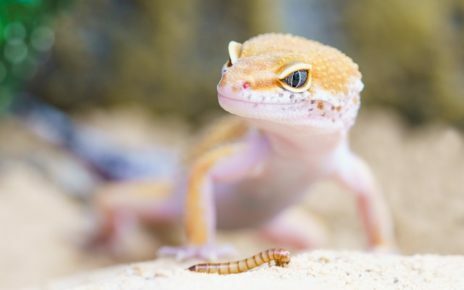 If you need a full spectrum UV light bulb that will last for years, the PowerSun UV Self-Ballasted Mercury Vapor UVB Lamp is the best mercury vapor bulb for bearded dragons available. 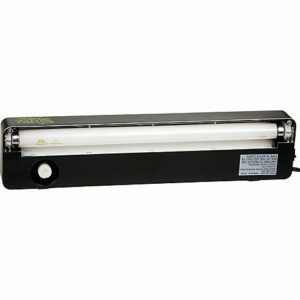 The Zoo Med ReptiSun Desert Compact Fluorescent UVB Lamp (Buy Online) will provide your bearded dragon with a strong source of UV light. This bulb emits UVA and UVB light while producing little to no heat. It has a UVA output of 30% and a UVB output of 10%. This light is suitable for small to medium sized bearded dragon habitats. It is recommended that this bulb is placed 7 to 10 inches away from your bearded dragon for maximal effect. At further distances, there will be a drop off in the amount of UV light that reaches your bearded dragon. Where this bulb really excels is in its power efficiency. It consumes only 26 watts of power but it emits the same amount of light as a 130-watt incandescent. That means you can leave this bulb on for longer periods of time without having to worry about busting your budget. And since fluorescent lights produce minimal amounts of heat you won’t need to use a ceramic socket or worry as much about the risk of fire. 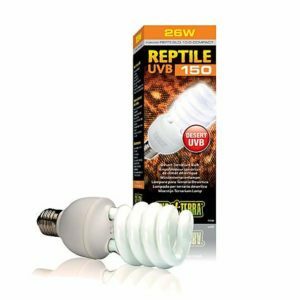 The Exo-Terra Reptile UVB150 Bulb (Buy Online) is a compact UVB bulb that is perfect for bearded dragons. This bulb is made for desert reptiles that need far more UVB light than their tropical cousins. And for that reason, this compact fluorescent bulb emits 10% of its light in the UVB spectrum. If you have a small to medium sized bearded dragon setup this light will provide adequate UVB coverage. Like other 26 watt compact fluorescent UV bulbs, this one will penetrate 7 to 10 inches before the UV light starts to diminish. 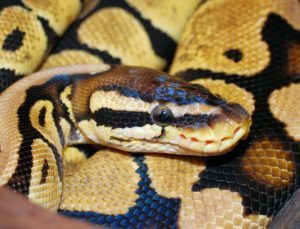 What sets this bulb apart from the Zoo Med ReptiSun is its size. This bulb has a spiral design in contrast to the ReptiSuns bent tube configuration. That means you can fit this bulb into a smaller reflector without having the end of the bulb protruding out of the fixture. If you already have a reflector this might be an important consideration before making your final decision on what compact fluorescent UVB bulb will work well in your situation. 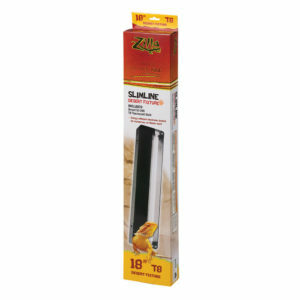 The Zilla Slimline Desert 50 UVB T8 Fluorescent Fixture (Buy Online) is perfect for someone who wants a UV bulb and a fixture in one convenient package. With this lighting system, you get a T8 fluorescent fixture and one 18 inch Zilla Desert 50 UVB Fluorescent T8 Bulb. This fixture will spread an even amount of UV light throughout your bearded dragons habitat. Unlike a reflector, this 18-inch fixture provides a more even source of UV light for your bearded dragon. 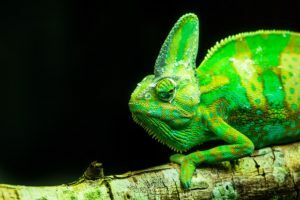 That means your bearded dragon will be bathed in UV light no matter where they are in their tank instead of in one small spot as tends to be the case when you use a reflector. The UVB light from this fixture will penetrate up to 12 inches under optimal conditions. While this might be a little less than lights that use a reflector it is more than made up for thanks to the lights even dispersal. And this light won’t boost your power bills since it only consumes around 15 watts of power. 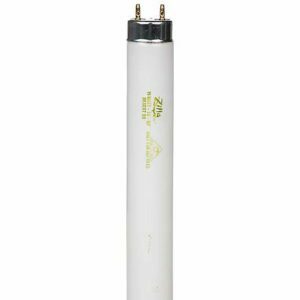 The Zilla Desert 50 UVB Fluorescent T8 Bulb (Buy Online) will act as a replacement bulb for the Zilla Slimline Desert 50 UVB T8 Fluorescent Fixture. It can also be used in any standard 18 inch T8 fluorescent lighting fixture. 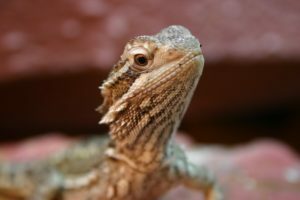 Using a fluorescent UV tube for bearded dragons has the advantage of providing a more diffuse source of UVB radiation. 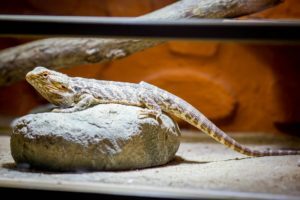 Bearded dragons need a more constant source of UV light throughout the day. This is in contrast to their heating needs which vacillate through the day. What this means is that using an 18-inch fluorescent bulb more closely matches a bearded dragons natural UV needs. These 18-inch fluorescent bulbs are rated to last up to 12 months before their UV output starts to diminish. They are also very energy efficient since they consume only 15 watts of power. If you already have the Zilla Slimline Desert 50 UVB T8 Fluorescent Fixture and you want a simple drop-in replacement then this bulb is one of your best options. 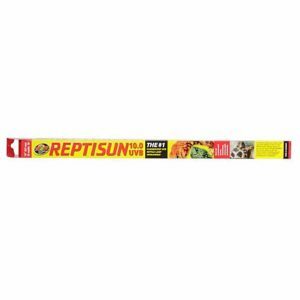 The Zoo Med ReptiSun T8 10.0 UVB Lamp (Buy Online) is a high power UV tube for bearded dragons. 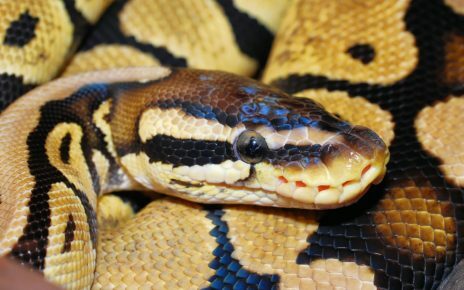 This 18-inch fluorescent tube emits 10% UVB and 30% UVA radiation. This light also has a higher output than the Zilla Desert 50 UVB Fluorescent T8 Bulb since it is an 18-watt bulb versus Zillas 15 watt alternative. One nice benefit of the added power consumption is an increase in how deep this light can penetrate a bearded dragons habitat. 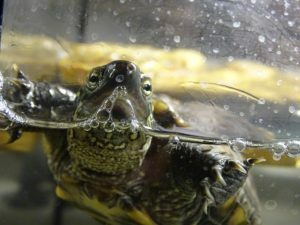 While the 15 watt Zilla Desert 50 UVB Fluorescent T8 Bulb can provide adequate UVB light from up to 12 inches, the 18-watt Zoo Med ReptiSun T8 10.0 UVB Lamp can penetrate up to 20 inches. 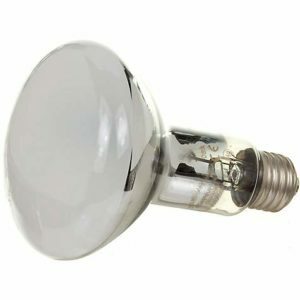 These high-quality German made bulbs use a quartz sleeve to provide added durability. The quartz glass has better transparency characteristics so more light actually reaches your bearded dragon. If you have a deep tank and you prefer to use an 18 inch T8 fluorescent then this bulb is the best option available. 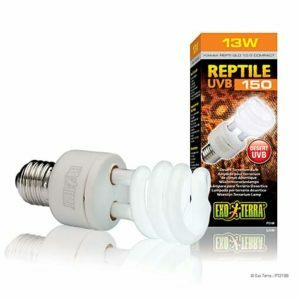 The Exo-Terra Reptile UVB 150, 13W (Buy Online) is great for supplemental UV lighting or for small bearded dragon setups. This light emits 10% UVB and 30% UVA radiation. And it is even more compact than the already small 26-watt version. When used with a reflector this light will penetrate deep into your bearded dragons habitat. Under optimal conditions, this light will provide sufficient UV radiation at up to 20 inches. Which is quite impressive given its low power consumption. This light bulb is perfect for small starter tanks or for breeder tanks where overall coverage is less of an issue. Another great use for this bulb is in a very large tank where you might have some gaps in your UV lighting coverage. Either way this low power bulb delivers a lot of UV radiation in a small easy to deploy configuration. 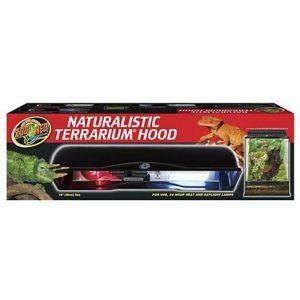 If you need an all in one lighting fixture the Zoo Med Naturalistic Terrarium Hood (Buy Online) is a great option. This fixture has two sockets one for a heat lamp and the other for your UVB light. This fixture has a length of 18 inches so it will easily fit on top of most bearded dragon habitats. Each socket in the Zoo Med Naturalistic Terrarium Hood can handle bulbs that consume up to 60 watts of power. Any UV bulb that uses a standard Edison socket will work with this fixture. 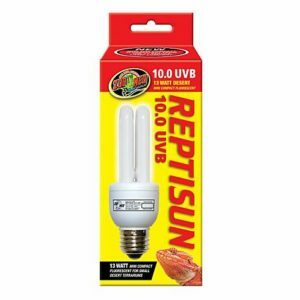 Though it is recommended you use the ReptiSun Bulbs since they are made by the same manufacturer so you can be sure they will fit into the reflector without any clearance problems. When it comes to heating lamp selection this hood can only be used with regular heat lamps and not ceramic IR emitters. You can use any daylight or red light heat lamp that consumes up to 60 watts of power. 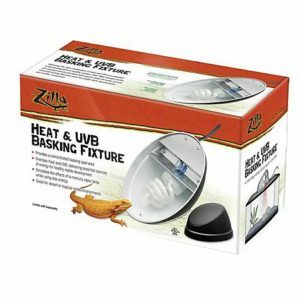 The Zilla Heat & UVB Basking Fixture (Buy Online) combines heating and UV lighting into one small unit. The main reason why this fixture is so compact is that it uses Mini Halogen Technology. These Mini Halogen Heat lamps provide the same amount of heat as a regular heat lamp while only being a fraction of their size. The UV light, on the other hand, is provided by a standard mini compact fluorescent. It is recommended that you use a Zilla Desert 50 20 watt compact fluorescent with this fixture, but any similarly sized UV bulb will be sufficient. The mini halogen bulbs are Zilla specific, so that will be your only option when you have to find a replacement. You can get the mini halogen bulbs in 25 or 50-watt variants, and they come in “day white”, “day blue” or “night red” so you can pick your preferred heat lamp spectrum. Halogen bulbs are also more efficient than incandescent bulbs since they consume three times less power. And they will last on average 2,000 hours so you will have to replace them less often.